India has presented a nine-point agenda to G-20 countries, calling for “strong and active cooperation” among them to comprehensively deal with fugitive economic offenders. 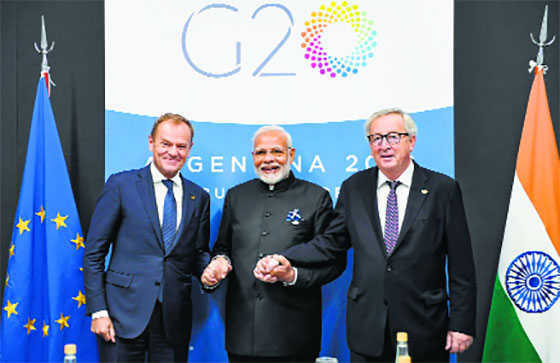 Prime Minister Narendra Modi presented the agenda in the second session of the G20 Summit on international trade, financial and tax systems here on Friday. Cooperation in legal processes such as effective freezing of the proceeds of crime, early return of the offenders and efficient repatriation of the proceeds of crime should be enhanced and streamlined, the agenda said. India also called for joint efforts by G-20 countries to form a mechanism that denies entry and safe havens to fugitive economic offenders. “Principles of United Nations Convention Against Corruption, United Nations Convention Against Transnational Organised Crime, especially related to ‘International Cooperation’ should be fully and effectively implemented,” it said. India suggested that the Financial Action Task Force (FATF) should be called upon to assign priority and focus to establishing international cooperation that leads to timely exchange of information between the authorities and financial intelligence units. “FATF should be tasked to formulate a standard definition of fugitive economic offenders. FATF should also develop a set of commonly agreed and standardised procedures related to identification, extradition and judicial proceedings for dealing with fugitive economic offenders,” it said.